I’ve been working on this piece since late summer, in short bursts in between other things. The pieces were small, at first. They kept curling in on themselves, the curve of the shell quickly resolving into abalone-sized abalone. And the Japanese enamels traditionally used in kintsugi kept giving me crazy rashes identical to poison oak. I kept pushing against the natural inclination of the shell to curl into a finished form. I wasn’t sure how big I wanted the final piece to me, but I knew I wanted it to grow monstrous. Kintsugi (which translates roughly to “golden joinery”) is the Japanese art of repairing broken ceramics. It’s also a philosophy: damage is seen as part of a thing’s history, something to be embraced, celebrated, accentuated, rather than disguised and hidden. Rather than throwing out a broken cup, a thick seam is made where the pieces are rejoined, and then a coating of red lacquer is painted over that seam. Finally, gold dust is sprinkled into the lacquer just before it finishes drying. It makes it hard to ignore the crack. 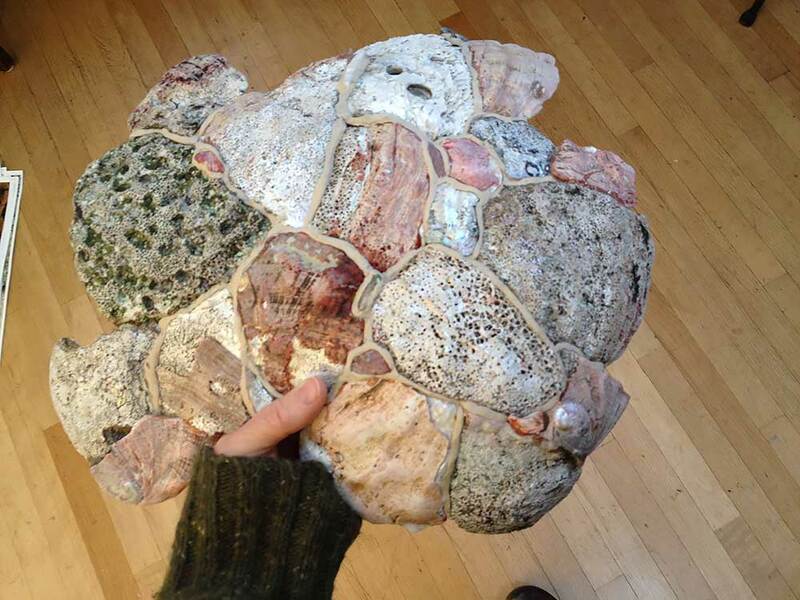 This past week, the kintsugi abalone started to grow to an awkward size, filled with contortions. And I realized there was no stopping. There is no final size. Since the initial inspiration was to heal the broken state of the abalone (and by implication, the abalone’s broken environment), I realized there’s no stopping until the abalone and its watery home are restored. That’s unlikely to happen during my lifetime. But until that happens, I think I’ll be picking up the worn pieces from the rocky cove at Stillwater and other nearby beaches, and just keep working on repairing. It’s the only thing that makes sense. This way, it’s the scope of time, the wait, that becomes monstrous. 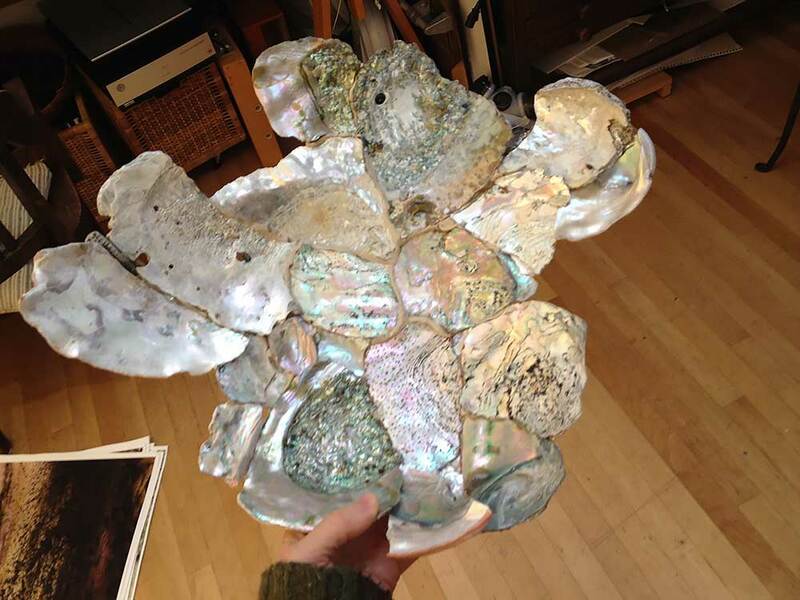 The abalone – unwieldy and oversized – remains beautiful. I am trying to imagine how I would look if all the damage in my history was repaired with golden seams.